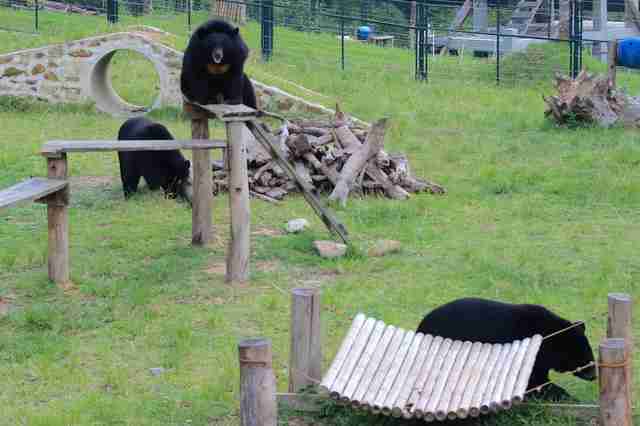 Happy #MoonBearMonday from the highest point of our Vietnam sanctuary! 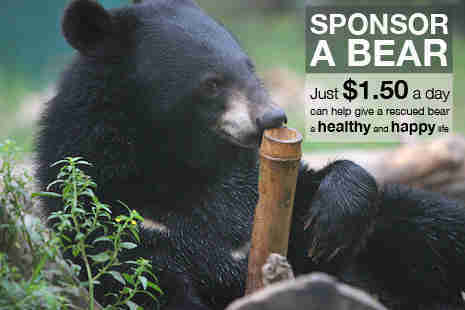 Since her rescue in 2010, Xin Xin has taken her rehabilitation one step at a time. She's seen off her demons, fought her way back to fitness and climbed her own ladder of success. Rescued as a cub from Dien Bien Province in northwest Vietnam, Xin Xin has had ample time to survey her kingdom. 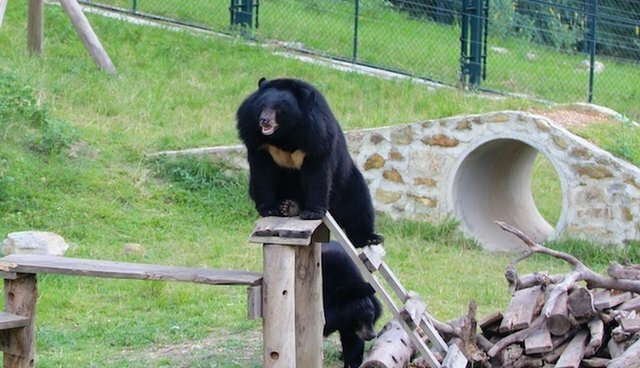 A climb like this would have been unthinkable for Xin Xin back when she was a three-month-old skinny newcomer to Animals Asia's Vietnam Bear Rescue Center - rescued on the way to a bear bile farm, where she would have faced daily painful extractions. Then she weighed all of 4 kilograms (approx. 9 pounds). Thankfully now she'll never know a single day of cruelty. She and fellow rescued cub Thomas had the run of their enclosure in those early days. They were always bigger than the other cubs their age, and were natural playmates. They jostled for the best swing, raced up ladders to get the best view. Xin Xin always won. But their playtime masked the fact that these orphans had suffered hugely as a result of losing their mother and being trafficked at such a young age. "Every cub is a struggle. From the outside they look like these incredibly cute little bundles of fun, but they've suffered a severe trauma. We can never replace their lost parent - but so much time goes into ensuring they have the best care possible. Watching Xin Xin now is incredibly rewarding. 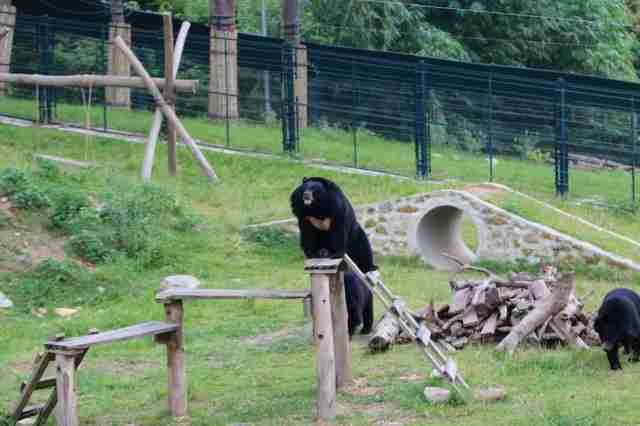 She's the kind of bear that will seem quiet and oblivious to the other bears in one moment, then get an idea out of nowhere to climb the highest play structure in the enclosure the next moment. And once she gets up there, she'll just smile that goofy, sweet smile of hers. You can't help but cheer her on." 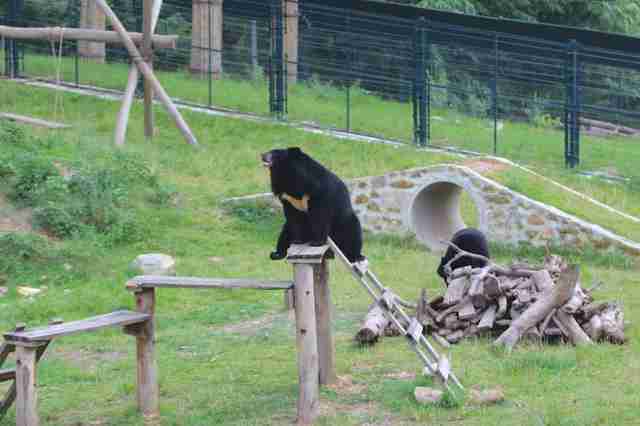 And on this sunny #MoonBearMonday, Xin Xin has once again made it to the top of the pile. What a comeback!